Volcanos spread south from Seattle, cones frosted white against the blue sky. Flying north, civilisation is trumped by the crumpled wilderness of mountain and sea. This gathers its own dusting of snow while the clear sky turns grey and mottled with cloud. We fall into conversation with Donna in the aisle seat. She is tanned from a fortnight with her daughter down in the Southern 49. We compare notes on the joys of parenthood. She hails from San Diego originally but is well naturalised now. Her dad was a pilot, as many Alaskans are. I think of the famous Fly Boys, those bush pilots that opened up the outback in the ‘20s and 30‘s. Pioneers like Carl Eilson, Russel Merrill and Bob Reeve wrote sagas and epic poetry with their vapour trails across endless daylight skies, above an empty wilderness. Approaching Anchorage the plane twists and turns through mountain passes, crosses stormy inlets, descends through veil after veil of heavy clouds. The full spectrum of grey and black is sundered by shocking white slashes. It is ominous, yet exhilarating. There is one last banking manoeuvre, I imagine the wings tilting near enough to the perpendicular, some passengers moan while we grip our seats before sliding in to touchdown at last, with some relief. Our luggage doesn’t show but it somehow seems unimportant. Anyway, our lift hasn’t shown up either. Both arrive simultaneously, an hour late. George, our driver, is another to hail from California. He came up here at age eight, hated it at first but loves it now. This certainly ain’t the sunshine state. Rainclouds are punctured by the serrated mountains and the long straight streets of Anchorage are shiny with rain. Weather clears by morning and it’s warm and sunny when we hit the streets. Head out of town on 5th Avenue, out to where the streets have names. Anchorage is a railway town and follows the typical template in its street naming. Avenues are numbered consecutively north to south, Streets in alphabetical order east to west. We walk past a knife shop and other places you might not linger. Loop back on 4th which becomes downtown after A st. It’s alphabet city after that. There are craft shops and souvenir joints aplenty. In one, rich with beautifully wrought clutter, we get talking to Richard Ziegler. Ziggy, as he is known, is a cobbler, odd job man, craftsman and muralist. He loves wolves and dogs, which form a recurrent motif in his art. He explains the First Nation and Inuit cultures of shape shifting. Consider a group of Eskimos – an allowable term in Alaska, apparently – out hunting. If one falls through ice and next animal to emerge is a seal, it is not unreasonable to explain that as a shape-shifting hunter. It is consoling, too. Across the road, a giant mural by Ziggy adorns the intersection of D Street and 4th Avenue. It celebrates the Iditarod dog-sled race which starts from here every first Saturday in March. The world’s best Mushers set off with their sixteen strong dog teams in a race lasting nine days or more across the desolate terrain of Western Alaska, all the way to Nome, up by the Bering Strait. This was once the only way to travel, before roads, before railways and aeroplanes. One famed race against time, in 1925, saw mushers deliver diphtheria serum to Nome. The lead dog on the last run, Balto, is commemorated with a statue in Central Park, New York. Murals and other visual tricks loom out of the city architecture elsewhere. A lifesize whale pod traverses a wall along one side of the Town Square Park nearby. 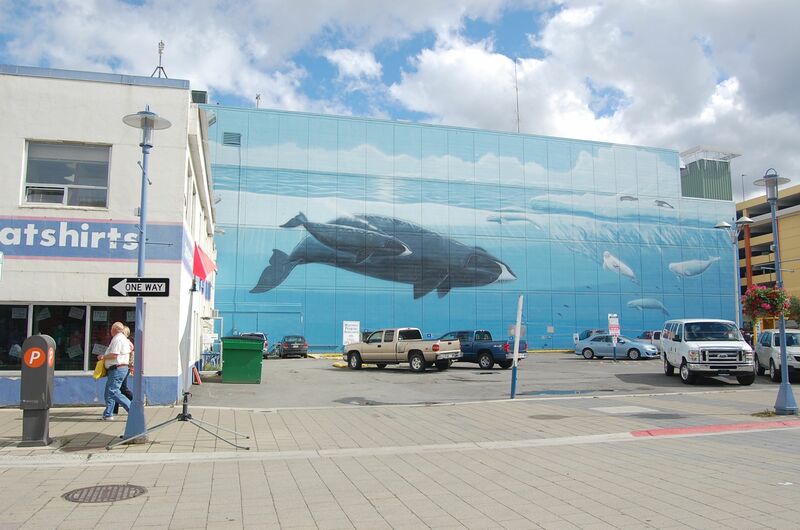 Painted freehand by Robert Wyland, it brings the surrounding wilderness within the city limits. The wilderness is a very tangible thing in Anchorage. One hundred years ago there was nothing here. Captain Cook had sailed up the inlet that bears his name, back in 1776, in a vain search for the Northwest Passage. He didn’t hang around, though the city’s finest hotel is named for him, and a memorial stands at the foot of 4th Avenue. The Russians were the first old world people to settle Alaska. Russian Orthodox churches still peep out of the Americana and remains the religion of Native population. Typically, the Americans struck gold shortly after buying Alaska from the Russians in 1867. The Yukon goldrush is much starred in the western psyche, even still. Many legends were spun from the untamed territory. Jack London’s ripping yarns, the lucid poetry of Robert Service. Alaska, for all its vast and numbing physicality, is very much a metaphysical construct. By the early twentieth century the Americans began to sew together their patchwork territory with the railway. Thus was Anchorage born, a halfway house between the port of Seward to the south and Alaska’s Golden Heart, Fairbanks, much further north. The oldest building to survive is the Oscar Anderson house. He was the 18th man to hit town a hundred years ago. He witnessed the growth of a roughhouse town, the engagement with the last frontier. The tussle still goes on. Oscar Anderson lived in this house until 1974, it is now converted into a museum; apparently he haunts it still. Nearby, the Tony Knowles trail heads out along the inlet, along by the railway tracks. The parkland meanders off into the suburbs. Along the main track is a scale model of the solar system. Devised by a local college student, it is designed on the principle that walking speed equates with the speed of light, testablishing the distances between the planets which are scaled down proportionately in size. At N street, Mars is a grape, while heading back along 5th Avenue, Venus a ping pong ball, Earth something similar while Mercury is a Malteser. The sun is a hemisphere sinking behind the city theatre. Rain is falling heavily as we pick up our rental the next morning. Heading north towards Denali on the Glenn Highway the landscape is ridiculously big. Mt McKinley, or Denali – the big one in the Native tongue – is an outsize tower dwarfing already impressive mountains surrounding. It is rarely visible. So, when it does peek palely through the mist, it is more suggestive of art or magic, a trailer from heaven’s movie. Some miles from Anchorage we are swallowed by the forests, human habitation dwindles and dies. It’s five hours to Denali where we find our wilderness lodge set on a dizzying crag overlooking the valley. The town stretches along the highway like a hastily fashioned necklace. The ad hoc boardwalk gives a feeling of frontier times. Ramshackle huts and houses are given to souvenir shops, craft shops, restaurants and snackeries. It feels both impermanent yet old. We eat at Prospector’s Pizza, the place is hopping. We fall easily into conversation with the locals, as is becoming customary. Kelly and her husband join us at the bar. He’s on crutches and has an accident prone life from which to draw his stories. He’s worked around here variously on construction and as a pilot. His hair-raising accidents only make him more cheerful. Before leaving he hops over to our table and presses a $20 bill on me. It would rankle with an Alaskan to let us leave without showing us hospitality. We emerge into the full glare of dusk. Grey veils float to the summits, catching fire as they drift north towards the uncertain sun. We walk onto a near deserted patio where four dudes are strumming guitars and sipping bottled beer. As the guitar music waxes I feel connected to evenings like this around the globe, experienced by me and so many others too. Glancing south I see a rainbow spin its arc through the retreating rain. It’s drawing a bridge from Denali across the sky, dropping its gold off god knows where. Behind me the music stops, and the light of evening sharply wanes. Our return to Anchorage is brief and passing. Above us, mountain, cloud and rain conspire to show the pathway into heaven. The city slips around us like a mirage. The ground below is slick with water, and it feels as if the city could at any time fade into droplets and air. I must come back some day, back to Anchorage and walk the streets of glory. Step again onto 4th Avenue, flip a Mustang lighter to fire up one last cigarette. With darkness drawing in, the feeling persists that I am sheltering under the rainbow. Cold creeps up, coating everything in its silvered glass. Anchorage recedes into infinite space, stars spread along the avenues and streets.